Step 1. Wrap one color yarn around 2/3 of the embroidery hoop. Then wrap the second color yarn around the other 1/3 with a second. Tie the ends to secure. 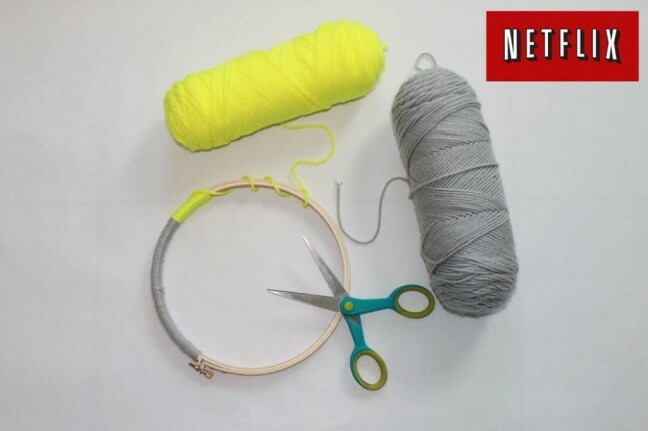 I chose to use neon yellow and gray yarn because I love that color combo. Step 2: Use your needle to thread small pom poms onto a seven foot piece of yarn (yes, surprisingly that long!!). Tie one end of the yarn onto the yarn-wrapped hoop. Then crisscross the yarn around the hoop creating a spider web-like effect on the hoop (be careful not to tangle it). Tie the second end onto the hoop as well. Use your scissors to cut out hearts, stars and feathers from colorful felt. I used gray, pink and navy blue felt. Combined with the neon yellow and gray, I feel like it gives a nice modern color palette. 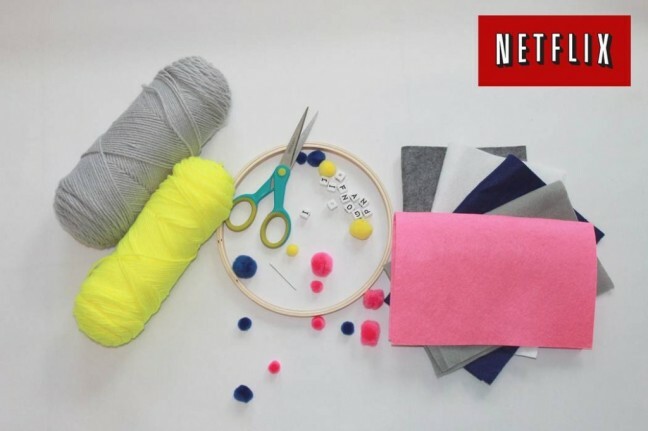 (Here is an easy video tutorial to show you how to make mini yarn pom-poms using a fork: http://www.youtube.com/watch?v=i0q-QHC_2cw.) Cut five 18″ pieces of yarn. Tie a knot at one end of each of the pieces. 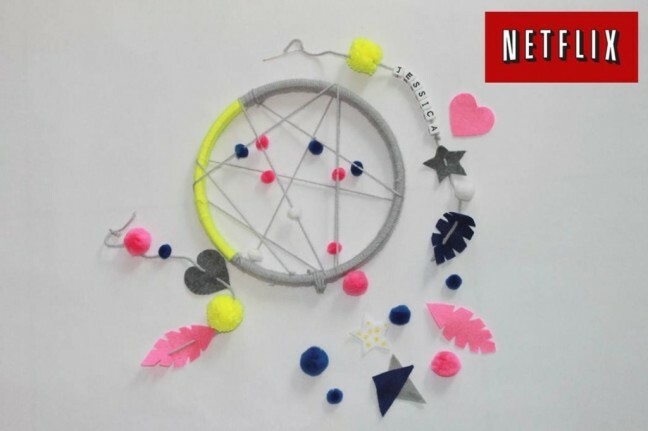 Then with your needle, start threading your pom poms, felt shapes, and letter pieces to personalize your dream catcher. Tie the second end of each of the pieces of yarn onto the bottom of your hoop. Cut a three-inch piece of yarn and securely tie it around the top of your hoop in a loop. 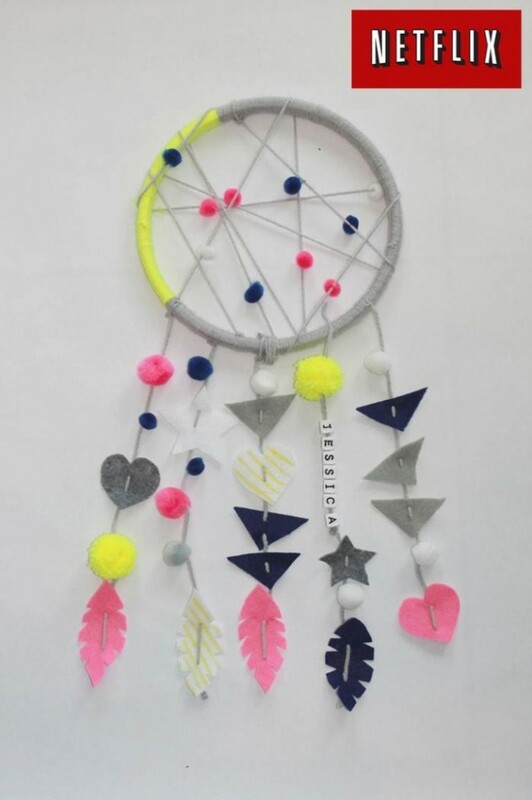 Then hang it over your child’s bed to catch all of his/her bad dreams! 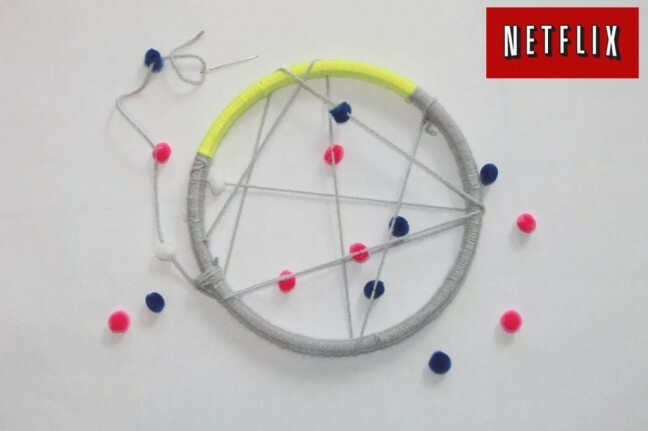 Check out this other dream catcher I created. It’s hanging up in my bedroom.